This page Laocoön and His Sons is part of the medium specificity series. The statue of Laocoön and His Sons (c. 25 BC), also called the Laocoön Group, is a monumental marble sculpture now in the Vatican Museums, Rome. The statue is attributed by the Roman author Pliny the Elder to three sculptors from the island of Rhodes: Agesander, Athenodoros and Polydorus. It shows the Trojan priest Laocoön and his sons Antiphantes and Thymbraeus being strangled by sea serpents. The story of Laocoön had been the subject of a play by Sophocles (the play is now lost), and was mentioned by other Greek writers. Laocoön was killed after attempting to expose the ruse of the Trojan Horse by striking it with a spear. The snakes were sent by Poseidon (although Athena or Apollo have also been suggested) and were interpreted by the Trojans as proof that the horse was a sacred object. The most famous account of these events is in Virgil's Aeneid (See the Aeneid quotation at the entry Laocoön), but this very probably dates from after the sculpture was made. Various dates have been suggested for the statue, ranging from about 160 to about 20 BC. Inscriptions found at Lindos in Rhodes date Agesander and Athenedoros to a period after 42 BC, making the years 42 to 20 the most likely date for the Laocoön statue's creation. It is not known whether it is an original work or a copy of an earlier sculpture. Interestingly, the figure of Alcyoneus on the Pergamon Altar (dated ca 180-160 BC) is shown in a pose and situation (including serpents) which is very similar to those of Laocoön in the sculpture group. It has been suggested that the three Rhodians were copyists, possibly of a bronze sculpture from Pergamon, created around 200 BC. Pliny in his Natural History (XXXVI, 37) states that it was located in the palace of the emperor Titus. He also asserts that it was carved from a single piece of marble, though when found it was discovered to comprise seven interlocking pieces. The statue was probably originally commissioned for the home of a wealthy Roman. It was unearthed in 1506 near the site of the Domus Aurea of the Emperor Nero, in the vineyard of Felice De Fredis; informed of the fact, Pope Julius II, an enthusiastic classicist, acquired and placed it in the Belvedere Garden at the Vatican, now part of the Vatican Museums. Michelangelo was called to the site of the unearthing of the statue immediately after its discovery. In 2005 Lynn Catterson argued that the sculpture was a forgery created by Michelangelo. When the statue was discovered, Laocoön's right arm was missing, along with part of the hand of one child and the right arm of the other. Artists and connoisseurs debated how the missing parts should be interpreted. Michelangelo suggested that the missing right arms were originally bent back over the shoulder. Others, however, believed it was more appropriate to show the right arms extended outwards in a heroic gesture. The Pope held an informal contest among sculptors to make replacement right arms, which was judged by Raphael. The winner, in the outstretched position, was attached to the statue. In 1906 Ludwig Pollak, archaeologist, art dealer and director of the Museo Barracco, discovered a fragment of a marble arm in a builder‘s yard in Rome. Noting a stylistic similarity to the Laocoön group he presented it to the Vatican Museums: it remained in their storerooms for half a century. In the 1950s the museum decided that this arm—bent, as Michelangelo had suggested—had originally belonged to this Laocoön. The statue was dismantled and reassembled with the new arm incorporated. The restored portions of the children's arm and hand were removed. In the course of disassembly, breaks, cuttings, metal tenons, and dowel holes have suggested that a more compact, three-dimensional pyramidal grouping of the three figures was contemplated or used in Antiquity before subsequent ancient and Renaissance restorations were made; the more open, planographic composition along a plane, familiar in the Laocoön group as restored, has been interpreted as "apparently the result of serial reworkings by Roman Imperial as well as Renaissance and modern craftsmen". There are many copies of the statue, including a well-known one in the Grand Palace of the Knights of St. John in Rhodes. Many still show the arm in the outstretched position. The copy in Rhodes has been corrected. The discovery of the Laocoön made a great impression on Italian sculptors and significantly influenced the course of Italian Renaissance art. Michelangelo is known to have been particularly impressed by the massive scale of the work and its sensuous Hellenistic aesthetic, particularly its depiction of the male figures. The influence of the Laocoön is evidenced in many of Michelangelo's later works, such as the Rebellious Slave and the Dying Slave, created for the tomb of Pope Julius II. The tragic nobility of this statue is one of the themes in Gotthold Lessing's essay on literature and aesthetics, Laokoön, one of the early classics of art criticism. The Florentine sculptor Baccio Bandinelli was commissioned to make a copy by Pope Leo X de' Medici. Bandinelli's version, which was often copied and distributed in small bronzes, is at the Uffizi Gallery, Florence. A bronze casting, made for François I at Fontainebleau from a mold taken from the original under the supervision of Primaticcio, is at the Musée du Louvre. A woodcut, possibly after a drawing by Titian, parodied the sculpture by portraying three apes instead of humans. It has often been interpreted as a satire on the clumsiness of Bandinelli's copy, but it has also been suggested that it was a commentary on debates of the time about similarities between human and ape anatomy. The original was seized and taken to Paris by Napoléon Bonaparte after his conquest of Italy in 1799, and installed in a place of honour in the Musée Napoléon at the Louvre, where it was one of the inspirations of neoclassicism in French art. Following the fall of Napoléon, it was returned by the British to the Vatican in 1816. Clamores simul horrendos ad sidera tollit (he lifted to heaven horrendous cries) is a phrase from Virgil's account of the death of Laocoön in the Aeneid. 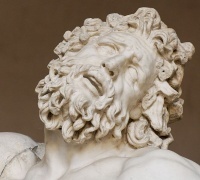 The horrendous cries are usually identified as bellowing and are referenced by Johann Joachim Winckelmann in "Thoughts on the Imitation of Greek Works in Painting and Sculpture," by Gotthold Ephraim Lessing in "Laocoon: An Essay on the Limits of Painting and Poetry" and commented upon by Charles Bell in his Essays on the Anatomy of Expression in Painting. Both Winckelmann and Lessing contend that the marble statue does not "bellow" as described by Virgil, but rather groans while Charles Bell contends that the statue is silent. Pliny's description of Laocoön as "a work to be preferred to all that the arts of painting and sculpture have produced" has led to a tradition which debates this claim that the sculpture is the greatest of all artworks. Johann Joachim Winkelmann wrote about the paradox of admiring beauty while seeing a scene of death and failure. The most influential contribution to the debate in Gotthold Ephraim Lessing's essay Laocoon: An Essay on the Limits of Painting and Poetry, which examines the differences between visual and literary art by comparing the sculpture with Virgil's verse. He argues that the artists could not realistically depict the physical suffering of the victims, as this would be too painful. Instead, they had to express suffering while retaining beauty. The most unusual intervention in the debate is William Blake's annotated print Laocoön, which surrounds the image with graffiti-like commentary in several languages, written in multiple directions. Blake presents the sculpture as a mediocre copy of a lost Israelite original, describing it as "Jehovah & his two Sons Satan & Adam as they were copied from the Cherubim Of Solomons Temple by three Rhodians & applied to Natural Fact or History of Ilium". This reflects Blake's theory that the imitation of ancient Greek and Roman art was destructive to the creative imagination, and that Classical sculpture represented a banal naturalism in contrast to Judeo-Christian spiritual art. The central figure of Laocoön served as loose inspiration for the Indian in Horatio Greenough's The Rescue (1837-50) which stood before the east facade of the United States Capitol for over 100 years. Near the end of Charles Dickens' A Christmas Carol, Ebenezer Scrooge comments that he was "making a perfect Laocoön of himself with his stockings" which is a direct reference to the statue of Laocoön since Scrooge is in such a rush to get dressed that he becomes entangled in his clothes. In 1910 the critic Irving Babbitt used the title The New Laokoon: An Essay on the Confusion of the Arts for an essay on contemporary culture at the beginning of the 20th century. In 1940 Clement Greenberg adapted the concept for his own essay entitled Towards a Newer Laocoön in which he argued that abstract art now provided an ideal for artists to measure their work against, and this title was copied by a exhibition at the Henry Moore Institute which exhibited work by modern artists influenced by the sculpture. Unless indicated otherwise, the text in this article is either based on Wikipedia article "Laocoön and His Sons" or another language Wikipedia page thereof used under the terms of the GNU Free Documentation License; or on original research by Jahsonic and friends. See Art and Popular Culture's copyright notice. This page was last modified 15:05, 11 November 2013.